The AHL's Hartford Wolf Pack will be renamed the Connecticut Whale on Monday at 5 PM, according to the Hartford Courant. A long-in-the-works deal for Howard Baldwin to take control of the American Hockey League franchise is apparently done. It was rumored he would rename the team the Connecticut Whalers. Perhaps he's saving that name for his ultimate goal of reviving the Hartford Whalers. 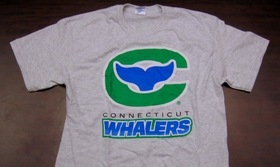 Connecticut Whalers T-shirtThe Courant says the deal and the rebranding efforts will be officially announced late Monday afternoon at the XL Center and that the new logo will not be unveiled. However, it could look something like what's on a t-shirt being sold through Baldwin's website. Wrote up a whole blog post last month. The team will open the 2010-11 season as the Wolf Pack; the name change is expected to take place at some point before midseason. The name, a new logo and uniforms are expected to be in place by Feb. 19, when the Whale face the Providence Bruins. That previously scheduled game is expected to be moved outside to Rentschler Field and played before an exhibition between a team of Hollywood celebrities — centered around the movie "Mystery, Alaska" — and former NHL All-Stars in celebration of the 25th anniversary of the NHL All-Star Game played in Hartford. The article says to expect the changes to the logos and uniforms to happen between Thanksgiving and Christmas. Definitely keeping an eye on that. A lot of the feedback on this story seems to be centered around the lack of a plural name — Connecticut Whale vs Whales vs Whalers. Actually, "a source close to Baldwin" was quoted in the article I referenced, explaining the choice. "Based on internal discussions and significant feedback from both Whalers fans and Wolf Pack fans, we've chosen a name that touches on our past but also signifies this new era in Hartford hockey," one source close to Baldwin said. "Fans have always referred to the Hartford Whalers as the 'The Whale,' so it's a very familiar name." Personally, I'm all for singular team names. They sound just fine to me. But then my team is the Lightning. It's not like I think every team should do it, but variety is always nice. Not only that, but I like the conscious choice of avoiding the Whalers name. They're wise to save that for a return of the NHL and the Hartford Whalers. Why diminish that?